It’s our business to connect people. We believe in creating lasting relationships that extend beyond day-to-day business. Your event succeeds when the combined group of multidisciplinary professionals transcends the typical client-vendor-contractor dynamic to become a united team focused on a common goal. We inspire loyalty and build respect by honoring diverse ideas, accessing the value that each person brings and weaving the best contributions of all into the fabric of your event. Our approach transforms ordinary events into meaningful, game-changing experiences. We are unafraid to consider unorthodox solutions to excite and inspire audiences. No event is too established to re-examine with fresh perspective. We boldly address challenges, designing custom solutions to fit your culture and business needs. We are always learning, seeking new trends and technologies at the forefront of our industry, to improve outcomes for our clients. We use our knowledge and experience to proactively identify opportunities and address potential issues on behalf of our clients. We seek to go beyond what clients and attendees request to truly understand the “why” behind it. Gaining a deeper understanding about our clients’ goals and motivations leads to opportunities for creating more meaningful, even delightful experiences. Not only do we tap into our own team’s expertise, we leverage the insights of our extensive connections to identify exceptionally creative and engaging event solutions. Open and honest communication is our hallmark. We are accountable, take ownership, and accept responsibility for our work. If any issues arise, we quickly address them. We are transparent with information. 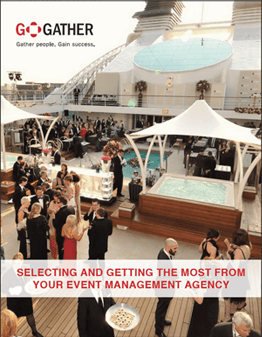 You have real-time access to every aspect of your event logistics, project timeline, and budget status. In everything we do, we adhere to ethical business practices, respect individual differences and champion quality above all. There was a genuine feeling that the GoGather team cared about our people. They were great about keeping the human element in perspective during even the most stressful times. I like the GoGather team’s creativity, professionalism and passion. I felt like they were an extension of my team.